Dan Leavy nods in agreement - this encounter against Wales is most certainly the biggest start of his career to date. Getting the call from the get-go against Japan on a summer tour is one thing, doing so in the Six Nations against Italy is another, but a full-blooded revenge mission, Grand Slam on the line kind of affair is on a different scale altogether. The evidence, based on Leavy's six caps, is that he was made for this level but it was interesting to note that Joe Schmidt publicly pointed out his poor missed tackle against the Italians a fortnight ago that ended up costing his side a try. It's something that the Kiwi doesn't often do, but you could tell that Schmidt was peeved, perhaps because he knows that a team like Wales will exploit an error like that more often than the minnows of Italy will. Back in the review session, Leavy didn't wait for Schmidt to highlight the error in front of the rest of the squad. He knew he had messed up and didn't need anyone to tell him so. "Yeah, it was just there were a few things wrong in the defensive system, we had a bit of wastage in the breakdown and stuff like that," Leavy reflects. "But I had to get him. I put my hand up for that meeting and said it was on me and that it wasn't good enough, so we can't afford lapses in concentration like that against Wales. "I knew myself and soon as the meeting started, I put my hand up and said, 'That was me and it's not good enough'. "We are a team at the end of the day so other lads said, 'I could have got a bit closer', and, 'I folded there', or whatever. The only way you're going to get better is if you look at your mistakes. You can't come out and play to 70pc of your potential and everyone telling you that you're a hero and stuff. "I'm always striving to get better, so I'll keep pushing myself and if I make mistakes I'll try to make sure they don't happen again." 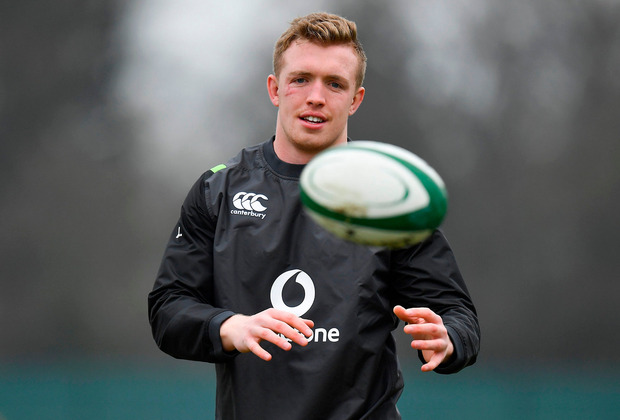 Leavy has had all week to mentally prepare for what lies ahead at Lansdowne Road tomorrow, which is a far cry from what he encountered at the same venue last year when he made his Six Nations debut. When Jamie Heaslip went down in the warm-up and Peter O'Mahony was sprung from the bench, Leavy, who was with the squad as an extra body, suddenly found himself having a key role to play as he took the Munster skipper's place amongst the replacements. "Yeah, yeah, we were walking in," the 23-year old recalls. "Usually when you're the 24th man you've been kinda watching a player who has been carrying a knock or something. "I was talking about not getting squeezed, then it was, 'Here's the 20 jersey, you're in'. But then it was fine once we got out. "I was going to have a shower and a protein shake. So it was a pretty big flip - two minutes later I'm walking out for the biggest game of the season, fireworks going off." With Tadhg Furlong missing through injury, there is a big focus on James Ryan as the tighthead lock, and Leavy has backed his fellow former St Michael's man to handle the pressure. "I always knew he was a bit of a freak," he adds. "He has really shone through. He has had a few injuries, same as myself, which kind of stalled him a little bit, but he is a great player. He's a weird lad. He refers to himself as The Big Cheese." Rúaidhrí O'Connor Joe Schmidt says the World Cup door remains open for the Seán O'Brien, but the Ireland coach had few crumbs of comfort for his star flanker after dropping him for tomorrow's penultimate Six Nations game against France. Rúaidhrí O'Connor All Blacks coach Steve Hansen has been attempting to pile further pressure on Ireland from afar but the Six Nations champions are having none of his mind games. Rúaidhrí O'Connor Joe Schmidt is hoping Warren Gatland and Wales can do Ireland a favour in Cardiff tonight by ending England's Grand Slam ambitions.